This 11 piece set features a dining table and ladderback side chairs. The dining table has a rectangle top and self storing leaves mean you don't have to think about where to store them when you don't need them. Extend the table from 64 inches to 100 inches, which means plenty room for guests or family members. Square block legs on either end give this table a sturdy foundation. 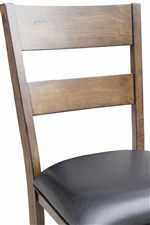 Ladderback side chairs have a faux leather upholstered seat that are comfortable and stylish. 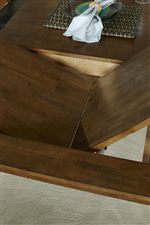 Finished in Rustic Whiskey, this table has a natural look with exposed knots and a textured top. Use this 11 piece set to update a large space with this casual and stylish dining furniture. The Mariposa 11 Piece Table and Ladderback Chairs Set by AAmerica at SuperStore in the Williston, Burlington, VT area. Product availability may vary. Contact us for the most current availability on this product. 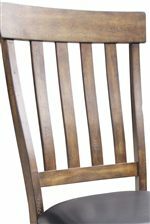 The Mariposa collection is a great option if you are looking for Casual furniture in the Williston, Burlington, VT area. Browse other items in the Mariposa collection from SuperStore in the Williston, Burlington, VT area.